Preheat oven to 200°C. Place the potatoes in a roasting tray, rub with the salt and bake for 30 minutes. Using the back of a kitchen spoon, press down on the potatoes until squashed. Place the butter and garlic in a jug and mix to combine, pour over the potatoes, top with the thyme and toss to coat. Place the cheeses in a bowl and mix to combine. Sprinkle the cheese mixture over the potatoes. 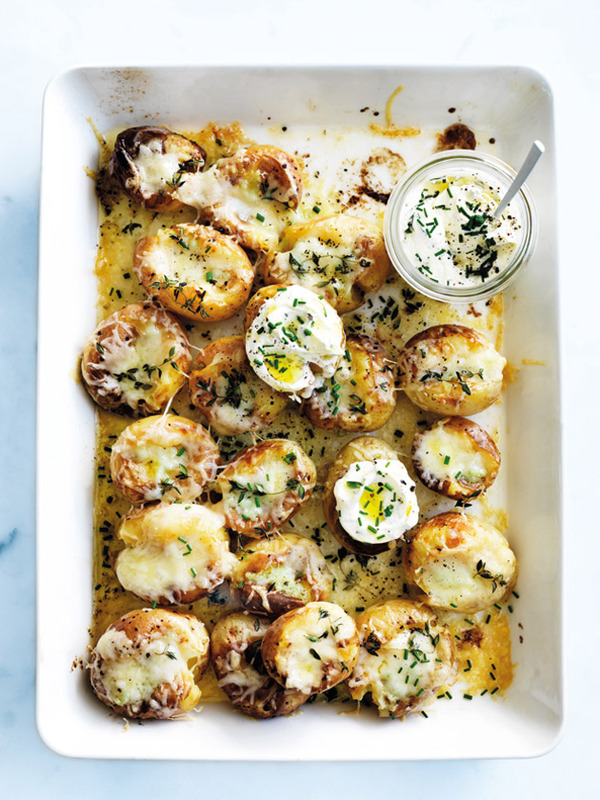 Return the potatoes to the oven and cook for a further 10–12 minutes or until the cheese is melted and golden. Place the sour cream and chives in a bowl and mix to combine. Drizzle with oil and serve with the potatoes. Serves 4.